"This is a really moist muffin if you don't overwork the batter. I'm a 'muffin snob' and I find myself making this same recipe over and over again! You'll never want to make a boxed blueberry muffin again." Preheat oven to 375 degrees F (190 degrees C). Grease 12 muffin cups or line with paper muffin liners. In a large bowl, beat 1/2 cup butter with 3/4 cup sugar until light and fluffy. Beat in eggs, and stir in vanilla and lemon zest. Fold in dry ingredients alternately with milk. Fold in blueberries. Remember, fold gently, don't stir. Spoon batter into prepared cups. Bake in the preheated oven for 20 to 25 minutes, or until a toothpick inserted in center of a muffin comes out clean. Cool in pans on wire rack. These muffins freeze really well, and re-heat in the microwave successfully. Hope you enjoy!! See how to make simple, delicious blueberry muffins. Look no further-if I could give this a 10, I would! But please do this: double the lemon zest and add 1/4 c. brown sugar. I bake these for a local farm and art market, they go fast! Yum! 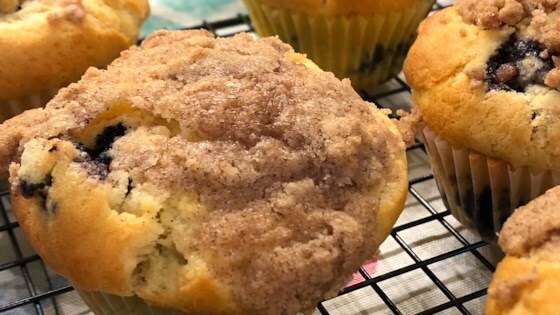 We loved this muffin recipe! They didn't last long! I used frozen blueberries and they came out really nicely. Will definitely make these again! Thank you! These were great. I even substituted half of the butter with applesauce, and they still turned out wonderful!